Buxted Park Hotel01825 733333work HotelSet in the heart of a 312 acre private estate, Buxted Park is a 4 red star hotel close to Uckfield and the Ashdown Forest, enjoying extensive views over and beyond the park landscape. A manor house and park were recorded in Buxted as far back as 1299 but when the estate was acquired by Sir Thomas Medley in 1722, the existing manor house was demolished and a new house built on higher ground where the hotel is sited today. During his tenure from 1827, the 3rd Earl of Liverpool disliked having the old village of Buxted and its peasants spoiling his panoramic view of the surrounding countryside and those who hadn’t moved away voluntarily, were forced to move their wooden houses across to where the village of Buxted is now. The only remaining original Buxted building is the parish church of St Margaret The Queen built circa 1250, where Cranmer’s Book of Common Prayer was said to have had its first introduction. The history of this Grade II listed Palladian mansion is as colourful as it is long. Over the years, this luxury hotel has played host to movers and shakers including William Wordsworth, Winston Churchill and Marlon Brando. Queen Victoria and the Prince Regent, King George V and Queen Mary were also regular guests. In 1940 much of the house was destroyed by fire however the then owner Basil Ionides, the designer of London’s Savoy Hotel, and his wife were able to restore the property using the finest architectural pieces such as covings, cornices, marble fireplaces and chandeliers salvaged from bombed out buildings in the London Blitz. 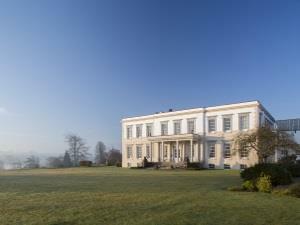 Understated Georgian styling meets modern comfort in Buxted Park Hotel's 44 bedrooms. Take your pick from unique feature bedrooms, large family bedrooms and classic bedrooms with beautiful views across the grounds. For special occasions, or just a well-deserved treat, it has to be one of the hotel's suites. Named after its most famous guests - including royalty and celebrity - these large bedrooms never fail to impress. Many bedrooms include spacious lounge areas, distinctive original features and one has a romantic four poster bed. The Dining Room is a two AA Rosette restaurant, where you can indulge in fine dining. If it's afternoon tea you fancy, make sure to stop in at the Coat of Arms Lounge or on one of our terraces with views across the estate. Do things a little differently and take advantage of a gourmet picnic lunch to enjoy in the grounds, or order a midnight feast to your room. Special menus have also been created just for children. The features of this hotel make it perfect for weekend breaks in Sussex, rest and relaxation, and simply enjoying the beautiful countryside. Set in the heart of a 312 acre private estate, Buxted Park is a 4 red star hotel close to Uckfield and the Ashdown Forest, enjoying extensive views over and beyond the park landscape. From A272 follow A26 to Uckfield by pass, then follow signs for A272 to Heathfield & Buxted. At Budletts roundabout take first exit A272 to Buxted. Go straight on at the traffic lights and the hotel is aproximately 1 mile on the right.